Last weekend, we mad a little drive up to Sandy Springs for a Saturday night dinner date at Hammock’s Trading Company. We’d seen the restaurant highlighted on an episode of Atlanta Eats, which I mentioned in a post earlier this week. It’s located in an unassuming stretch of Roswell Road, but inside, it’s full of beachy character, music, and what appear to be a lot of neighborhood customers. The restaurant describes itself as a place where Southern Coastal Seafood meets Baja California. 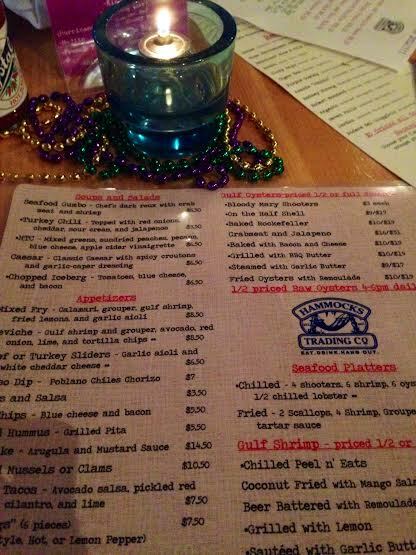 We happened to be there over the end of Mardi Gras week, so they had a special New Orleans-inspired menu (and lots of Mardi Gras beads) in addition to the regular fare. They have $5 sangria, margaritas, and mojitos every day, so we took advantage of that. My sangria was very festive, as you can see. 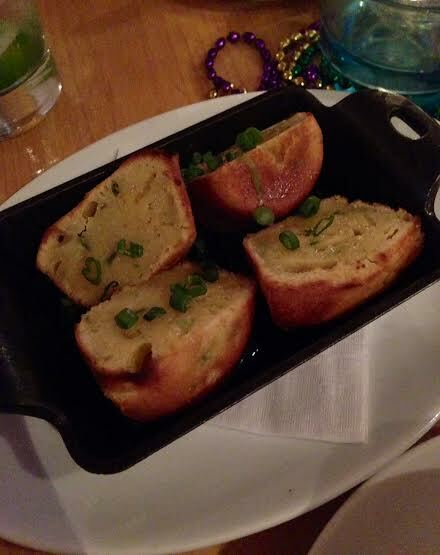 We started with one of the specials, chicken and sausage gumbo, and added on some jalapeno cornbread from the regular menu. We couldn’t get enough of the gumbo — it was spicy and filled with lots of meat. The cornbread, however, left a little to be desired… it was late coming out from the kitchen, and I think they under-cooked it in an effort to get it to us more quickly. I liked the presentation, though. The dinner menu is pretty extensive, but I don’t eat a lot of seafood, so I went with the Crabcake appetizer and a side of Cheddar Grits. Crabcake = full of meat and really good. 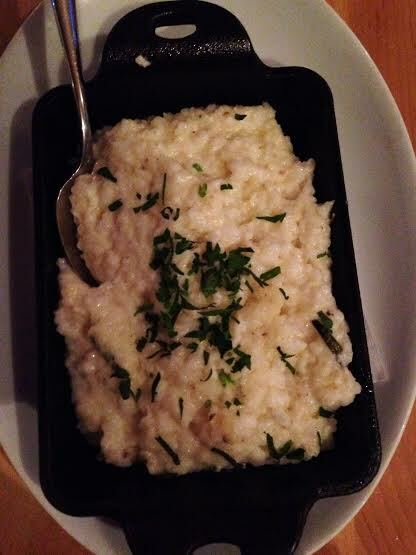 Grits = AMAZING! I am a sucker for some good cheese grits. They were thick, cheesey, but not overpowering, and just so good. Craig went with one of the specials — the Shrimp Creole — and it was a pretty big dish filled with nice-sized shrimp. One of the best parts of our dining experience was the waiter. I can’t remember his name, but he was so enthusiastic and really seemed invested in working for this restaurant. You don’t often see that, so it was much appreciated. If you’re out in Sandy Springs and want some good seafood options that won’t break the bank, check out Hammock’s Trading Company. Thanks for coming in and dining with us! Glad you enjoyed it (sorry about the cornbread though…) I love your page! Hope to see you again soon! Thank you so much for checking out my blog, William! My husband and I had a great time at your restaurant, and I know we’ll be back. Thanks for a great dinner!